400,000 New Homes - How? In yesterday's Autumn Statement George Osborne announced that the government's spending on housebuilding will rise to £1.2bn per year by the end of this parliament, which is expected to deliver 400,000 new homes by 2020. It is claimed that the 400,000 government funded new homes will be affordable both to rent and buy, half of new builds will be starter homes sold at 20% below market value for first time buyers. But how are these new house going to be built? Successive governments have failed over the past 30 years or so to meet their housing targets. Construction is not weather dependent - it can be done at any time of the year. Predictability and greater control in the construction process. 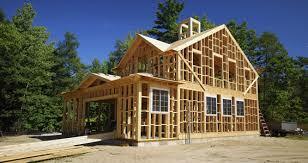 Environmentally friendly building and construction process. Excellent value for money, reduced build cost thanks to speed, quality and ease of erection. So timber houses could be the solution to the housing shortfall. They look even better if clad with western red cedar or Siberian Larch from Bennetts Timber!